The KoldLok Round raised floor grommet, from Upsite Technologies, a division of Aquila, is available in two sizes 4″ and 6″. Both versions of the KoldLok® Round raised floor grommet feature Hybrid Brush Technology (HBT), which combines KoldLok brush technology with a membrane layer. The KoldLok Round raised floor grommet is available in two sizes, 4″ or 6″. The grommet uses KoldLok’s Hybrid Brush Technology (HBT) which combines brush with a lower membrane layer, the result is an exceptional sealing grommet that improves airflow management. The circular design of the KoldLok Round makes it easy to install as the opening in the floor tile can be cut using a hole saw, through this installation method the labour time of installation can be reduced by over 50% over cutting traditional openings. The KoldLok® Round can be used to seal cable openings in new and existing raised floor cut outs. Sealing cable cut outs within the raised floor greatly reduces bypass airflow, increases the useable cooling unit capacity and ensures maximised efficiency from the CRAC unit. Increases existing cooling unit capacity, reducing the need to purchase additional cooling. Improves IT equipment reliability and extends equipment life. Increases static pressure under the raised floor. Improves volume of conditioned air delivery through floor grilles. The 6″ KoldLok® Round grommet allows large cable bundles or commando style PDU plugs to be pulled through the usable area. 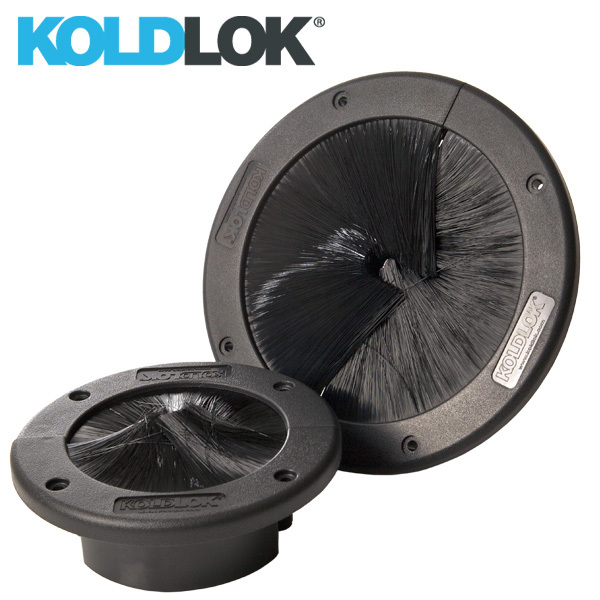 The 6″ KoldLok® Round gromment has an impressive 22.55 square inches of usable cable area. The Split feature of the KoldLok® Round 4″ and 6″ allows the product to be installed or removed without disturbing cables. The KoldLok® Round contains no loose or partially fastened parts. The KoldLok® Round uses an extra sealing HBT membrane layer that provides support to the brush structure and a highly efficient seal. A tapered joining structure ensures the KoldLok Round is held securely together. KoldLok® products satisfy NFPA 75 Section 5-4.4 for self-dressing metal edges and comply with European RoHS requirements.